Writing to the law-makers about the law-enforcers has become a waste of time. In more recent times, it has proved fruitful only after many years of constantly badgering officialdom had proved there were faults that need correction. It also helps to have many contacts willing to stick their heads above the parapet to add a little spice by courting publicity occasionally. Injustice and corruption are ever present evils in every society; add a large dose of vindictiveness and you have the essence of this particular case involving Maurice Kirk. 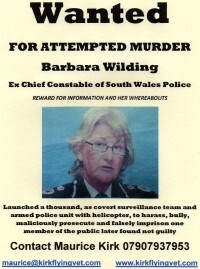 That the South Wales Police, and all involved in the persecution of this elderly man, are still being allowed to pursue their particularly nasty tactics is as baffling as it is contemptible – but that’s British Justice if you are unable to drum up the essential influential support necessary to make a dent in the armour of corruption surrounding this particular case. Sadly, most people with possible influence, including the Prince of Wales and politicians like the Prime Minister have been approached, but they obviously did not deem the case worthy of their lofty intercession – their aids trotting out the old faithful about not getting involved in individual cases. You have to wonder just how many elderly men of seventy-plus can be experiencing exactly similar conditions to warrant it not being an individual case – but one that merits collective treatment? Ordinary people with conscience are involved, but apart from being an irritation, are largely ignored. 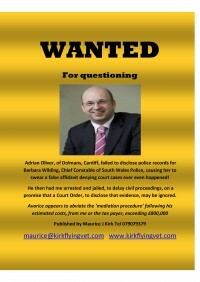 Maurice Kirk is in his seventies and very unwell, he does not – and never has posed a threat – except to the pride of the South Wales Police – but the vitriolic manner in which he has been mentally and physically abused has confounded those of us who are old enough to remember a time when justice and the law in Britain were respected as attributes of the society in which we lived. This is no longer the case; neither are respected as much as they and their administrators are feared.